On October 29, 1929, on what would become known as “Black Tuesday,” the stock market crashed. In one terrible day, the market lost fourteen billion dollars (about $188B today), signaling the beginning of the (roughly) ten-year-long Great Depression, with most of the last vestiges of the downturn only ceasing around 1939 due to the onset of World War II. Just as the effects of an economic downturn spread from Wall Street to the farmers of rural America, another major problem arose: a severe drought struck middle America. Starting in 1931, the drought, coupled with poor farming practices, caused hellacious dust storms to envelope much of America’s midwest. Through much of the 1930s, these storms ravaged land, crops, and topsoil, making it impossible for many crops to grow and the farmer to earn a living. The worst of it happened on what was supposed to be a beautiful spring Sunday. 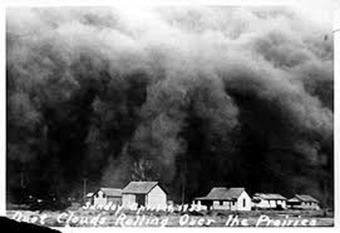 On April 14, 1935, later called “Black Sunday,” a dust storm darkened the sky from northern Canada to southern Texas. The next day, when reporters wrote about the incident, they made references to the “dust bowl,” including this in the Associated Press, “Three little words… rule life in the dust bowl of the continent – ‘if it rains’.” From that moment forward, “Dust Bowl” was used to describe the panhandle of Texas, Oklahoma, Kansas, Colorado, and parts of New Mexico. 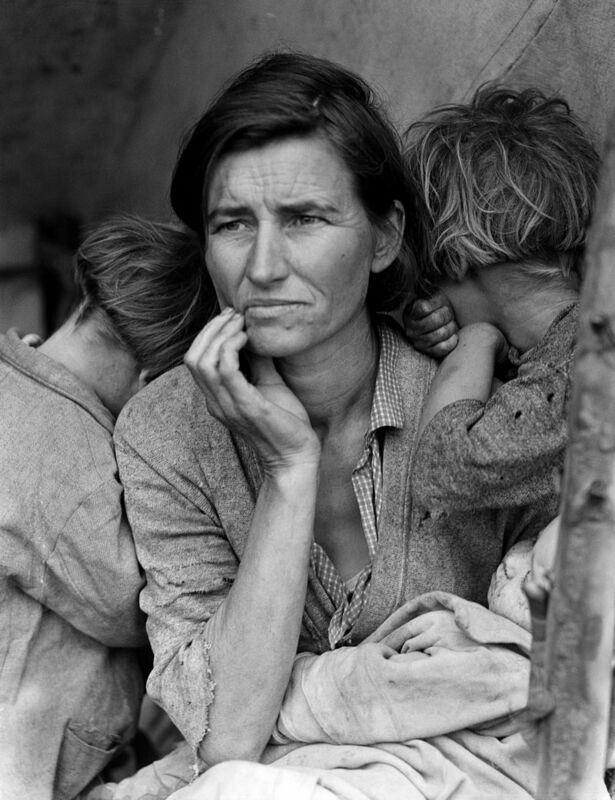 Between the dust storms, the economic downturn, and a belief in a better life, many farmers and families pulled up their stakes and left the Dust Bowl. Piling into their wagons and cars, they looked west, much like their ancestors from a hundred years before during the California Gold Rush, and headed to the supposedly work-paved roads of California. With nearly 200,000 people (about 1 in 600 in the U.S.) making their move, it was one of the greatest mass exoduses in American history. During the Dust Bowl exodus, it was estimated at the time that nearly a thousand people per day crossed into the city’s borders. But Los Angeles was also struggling due to the Depression. Jobs, thought plentiful by the migrants, were actually not. Even native Angelenos had a hard time finding work, much less with a massive number of new additions joining them. This also allowed employers to hire the desperate workers for lower wages, further angering locals. 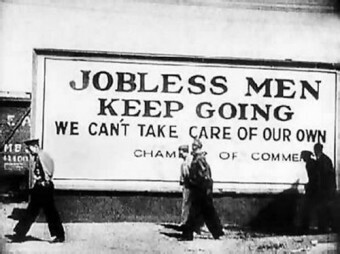 With these issues reaching a head, the Jones-Redwine Bill was proposed in the California State Assembly in May 1935 which would, “prohibit all paupers, vagabonds, indigent persons and persons likely to become public charges, and all persons affected with a contagious or infectious disease from entering California until July 1, 1939.” It didn’t pass, but it was clear something had to be done. Still, the mass migration didn’t stop, that is until someone took this task, and the law, into their own hands. The Los Angeles police chief at the time was James “Two-Gun” Davis, who already earned a reputation as being no-nonsense and corrupt. He was the man behind the “Gun Squad,” where he allowed select officers to take down gangsters by any means necessary, even illegally. He once said, “hold court on gunmen in the Los Angeles streets; I want them brought in dead, not alive and will reprimand any officer who shows the least mercy to a criminal.” Point being, when he wanted something done, he did it and didn’t care at all if it was against the law he had sworn to protect. Beginning in November of 1935, he sent 136 LAPD officers to 16 different California entry points, ones that bordered Arizona, Oregon, and Nevada with orders to turn back any incomers with “no visible means of support.” It was a harsh way to deal with the crisis and one that was not legal. By December, these officers had become known as the “Bum Brigade.” They were given specific orders to search all incoming cars, wagons, and trains. Those who had “no means of support,” no train ticket, or were under suspicion for “vagrancy” were told to either leave the state or face jail time. Many choose to turn around and leave. April brought the ACLU lawsuits and the ending of Davis’ Bum Brigade. ACLU director Ernest Besig said that LAPD officers were “conspiring to take away the civil rights of United States citizens,” and that the policies enacted were a “violation of the city charter and the state and federal constitutions.” Other officials questioned why immense city funds were being used for this far-flung project. The officials were eventually called home to LA, but Davis claimed victory. He stated that over 11,000 people were turned away which caused an “absence of a seasonal crime wave in Los Angeles.” He estimated that over four million dollars were saved on policing “thieves and thugs” and paying out welfare payments. In 1937, the Resettlement Administration (one of FDR’s New Deal agencies) began building migrant camps along California’s border to temporarily house those trying to enter the state. Eventually, the Farm Security Administration, whose job was to combat rural poverty during the Depression, took this over. This was, at least, a more practical, if not slightly more humane way of dealing with the migrant problem. 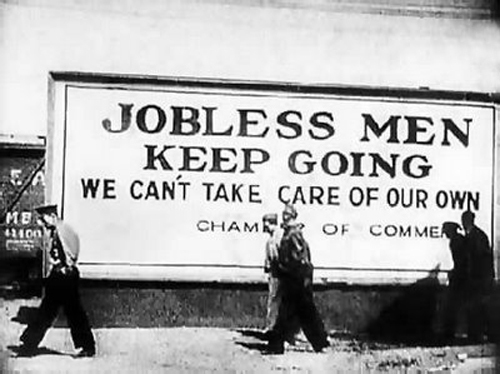 On December 7, 1941, the Japanese bombed Pearl Harbor bringing America into World War II officially and, most historians consider, out of the Great Depression. War time production immediately took hold of the country and America began its rise into the prosperous 1950s.